Manufacturing of nylon bristles, crimped bristles, nylon mono filament yarn, pp bristles etc. We are well reckoned as one of the leading Nylon Yarn Exporters in India. Our optimum quality Industrial Nylon Monofilament Yarn is very popular in UAE. Tipped Nylon Bristles offered by us are ideal for knitting, fishing, Synthetic ropes and for various other purposes. We use high quality raw materials to assure the durability of Tipped Nylon Bristles. Our Nylon Monofilament Yarn is available in various diameters and colors to meet the different requirements of the clients. We are one of the distinguished Manufacturers of Crimped Bristles. Our Crimped Bristles are perfect for the easy cleaning of the dust particles and trash. The cut length of these bristles is available with us in standard size of 15 inch, 20 inch, 30 inch and 47 inch. The diameter of our Crimped Synthetic Bristles ranges from 0.15mm to 0.60 mm. Our Crimped Synthetic Bristles are widely used in the Industrial Brushes, Toothbrushes, Petting and so on. House hold brooms and brushes. Large road brushes and car wash brushes. We can offer PP in Crimped and plain types as per requirements. We are one of leading Stiff Nylon Bristles Manufacturers & Exporters in India. We manufacture these Bristles in Nylon-6 and Polypropylene materials. Our Nylon Bristles have high flexibility and bend recovery features. They are highly resistant to chemicals and abrasion and can be used in high temperature. Excellent elasticity and brilliant thermal sterilization endurance property distinguish our Tipped Nylon Bristles from other brands present in the market. 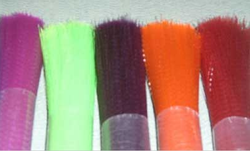 Our Tipped Nylon Bristles are available in several colors like natural, black, green, florescent and so on. These Tipped Nylon Bristles are extensively used in brooms, cleaning brushes, industrial brushes, paint and cosmetic brushes, household brushes, toothbrushes and hairbrushes. High flexibility, excellent elasticity and bend recovery. Highly resistant to chemicals and abrasion. Can work at high temperature and endure thermal sterilization. Larger brooms and cleaning brushes. Industrial brushes, paint and cosmetic brushes. Jay Monofilaments P. Ltd. is one of the leading Polypropylene Bristles Manufacturers and Wholesale PP Pet Bristle suppliers based in India. We offer PP Bristles in Crimped and Plain types as required by the customers. Polypropylene is versatile and easy to process material. It has low density and high stiffness due to which it gives excellent work performance. It is available at moderate price thus bristles made up of it are inexpensive. Our PP Bristles are used in household brooms and brushes, personal care brushes, industrial brushes, large road and car wash brushes. Standard size of cut length of 15 inch, 20 inch, 30 inch and 47 inch in 25kgs/ 50 kgs are available.